Campeggio Les Chambons si trova a Argenton-sur-Creuse, Indre, è situato fiume/torrente. Questo campeggio dispone di piazzole delimitate, sia ombreggiate che, senza ombra e piazzole poco ombreggiate. È possibile affittare casemobili. Ogni anno un ispettore visita il Campeggio Les Chambons, controllando oltre 200 tra attrezzature e altri punti di interesse del campeggio. L'ispettore è un dipendente ACSI e non lavora per il campeggio. We love this place, great friendly and helpful staff, quiet and good size pitches marked off with hedges, access to the river for kayaking, 20 minute walk into town and some great cycling. Good bars and restaurants in town. If you are looking for a nice affordable and comfortable site this one will fit the bill nicely. Cosa è piaciuto - The campsite was small and well maintained. We loved being by the river. Cosa non è piaciuto - It is quite noisy with a road, train and the weir from the river all keeping a constant soundtrack - but it didn't disturb us too much. Lovely location right on the river but the walk into town was nice for 200 yards along the river and then strewn with rubbish before entering and ugly part of town, once was enough. Toilets not working and one disabled available for entire site on our stay. Had planned to stop 2-3 nights but stayed only one night. Lovely location, a short walk to the town. No toilet paper is provided, and none for sale on site, so come prepared! This is a very pleasant, well-laid out municipal campsite within 15 minutes walk of Argenton sur Creuse. It is a very clean site with excellent sanitary facilities and a helpful manager who spoke some English. It is right by the river which our dog really enjoyed splashing about in and there is a very pleasant river walk which can be accessed directly from the site. The bread van visits each morning. Internet is free which is a real bonus. Recommended as a stopover or for a longer stay. A pleasant campsite just outside of the very picturesque town of Argenton-sur Creuse. The river at its associated walks are a real plus as is the surrounding area. Recommended. Site very pleasant and facilities OK. The walk into town starts well, by the riverside, but degenerates into a rather long struggle through a scruffy area (not helped by roadworks when we were there). It certainly takes more than 15 mins to the town centre! Volete prenotare il campeggio Campeggio Les Chambons o oppure saperne di più? Potete farlo usando i seguenti dati oppure tramite il sito del campeggio. Da nord A20 Orléans-Limoges, uscita 17, seguire i cartelli. Su navigatore inserire Saint-Marcel. 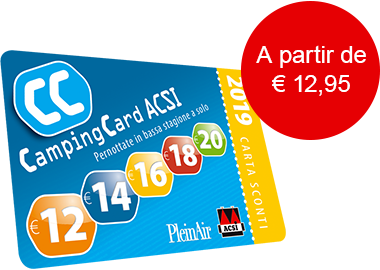 ACSI Eurocampings invia la tua richiesta di informazioni al "Campeggio Les Chambons".